In 2009 Western Power published their proposal for a "Bi-directional Reference Service and Associated Tariff" which then already targeted Households with solar PV to pay for losses incurred by peak power demand - in vain. This proposal had to be published for public comment and - despite its complicated architecture trying to hide the true intent - in the end wasn't put into practice after strong opposition. This time it isn't that clandestine an approach, the Barnett government is growing bolder. On ABC TV news on one hand the "Energy Minister Mike Nahan says changes to the way household energy costs are structured will not result in higher prices. ", on the other hand they state that "rapid increase in the number of households installing rooftop solar panels has contributed to a drop in energy consumption and a revenue shortfall for state-owned power companies. So the State Government is considering changing the way West Australians are charged for energy use, to protect the long-term viability of the state-owned power grid." "What we would do is [reduce] the user charge and increase the fixed price," he said. This means that PV households - which are still connected to the grid but using less power from it than other households - will hardly benefit from a price reduction for the use of electricity and instead will be forced to pay more for poles and wires. They had invested 1000's of dollars earlier in PV attempting to becomes less reliable on the grid, to become a bit more self sufficient, to save a dollar or two, and to do their bit on climate change. Instead of reading the signs of the times by admitting their power policies have failed and need shifting, e.g. by modernising the grid towards a smart grid (in the non-controlling but load balancing sense) and penalising high power usage the state government tries to save their stone-age assets in favour of modernising an industry, protecting everything that looks like, feels like, and smells like mining; trying to lure the unwary voter with low prices for consumption which in turn would encourage even higher consumption, in these times when use of fossil fuels is indicated left, right, and center. 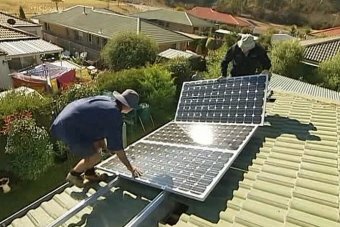 "Dr Nahan says about 2,000 households are applying to install photovoltaics (solar panels) every week and the government must change its charging system to reflect the trend" ... to recoup lost income for the state budget.